Hello Friends, It’s time again for our weekly challenge over at Just Us Girls. I sure hope you had a chance to play along last week as we had some wonderful prizes up for grabs. Congrats to all 4 of our winners! 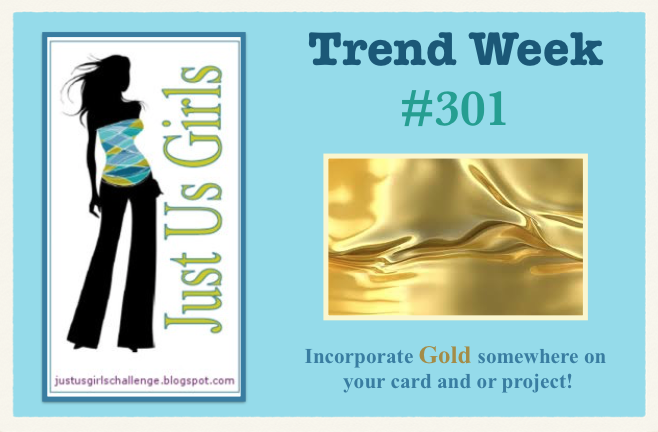 This week is our Trend Week and Lisa has asked us so incorporate gold onto are cards and or projects. At first glance you may not see any gold on my card, however I have used gold stickles on both centers of my flowers in and outside the card and on the flower petals on the front. I can’t take credit for this entire card, my fabulous SU consultant got me started and I changed it up quite a bit and added to the layout when I got home form her house. I would link up her personal blog for you, but sadly enough she doesn’t have one. I do love this type of tri-fold card…so fun! I wanted to show you what the card looked like when it’s closed, that is why you see my giant clothespin. All supplies are form Stampin UP except for the sunflower die (Sizzix), and the petals (MS punch). I colored the Koala with my spectrum Noir pens and a little colored pencil to give him some fluff! Here is a better view of the inside! Categories: Cards | Tags: Card making, Cards, rubber stamps, stamping, Stamping Up, Thinking of you, tri-fold | Permalink. He is seriously CUTE! I noticed the gold right away it sparkles!!! Love the fold, brilliant! Love your adorable card and that cute koala. I like the type of fold also. The gold just sparkles. He is so fun along with your folded card! Sweet card with that adorable little koala. I love that fold. Super cute design…love the koala! Great colors too! Very cute card and love the colour combo. LOVE this darling tri-fold. That little guy is so adorable! How very Australian to have your koala on this card. Just love those little fellows. Great fold and lovely design. Nice touches of gold there. I sometimes change my card a little after being to my SU class too lol. Looking forward to mine this week end only the weather will be freezing. That little koala bear is just too cute! I love your fold on this and awesome color combo. The touches of the Stickles is perfect! I haven’t done a folded card like this in ages, Nancy. Yours looks fabulous with that darling koala taking center stage. Love the trifold…such a different take on the traditional card! Love your touches of gold too! Very pretty card!